We look forward to the next EHLTC in Vitoria Gasteiz (Spain). Vitoria Gasteiz is the capital of the Basque Country. At the final evening in Lignano, the EHLTF flag was handed over to the representatives from Spain (Maite San Saturnino, Emilio Bautista Soto). 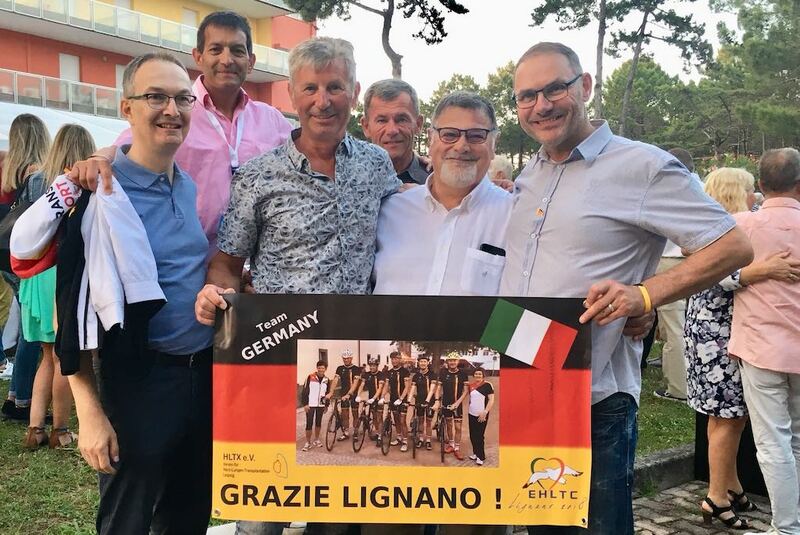 The 17th European Heart and Lung Transplant Championships took place from June 11-16 in Lignano Sabbiadoro. The championships were a big avowal to organ donation and life after a transplant. As expected, the competitions could be carried out in the best weather. Directly from the sports grounds led a way to the beach of the northern Adriatic, where you could go swimming in wonderful water. The participants were in the grounds of the sports park GTur in Lignano housed in different buildings. Clean accommodations and very good food were an affair of honor for our Italian hosts. Especially the opening and closing evenings were culinary highlights. A total of 229 athletes (62 female and 167 male) and 169 supporters took part in the games. Many thanks to the organization around Nevio Toneatto for the excellent games in Italy! The next games will take place from 11 to 16 June 2018 in Lignano Sabbiadoro, Italy. The members of the board were already able to convince themselves of the state of the preparations and are sure that they will be impressive games. The 2016 Championships, were hosted by the Finnish Sports Association of Persons with Disabilities to promote transplantation success and encourage organ donation in Finland. On 19 / 20. February the EHLTF MC met in Leiden to the last meeting before the European Transplant Sport Championships 2016 in Finland. The agenda included the evaluation of the activities in the past year as well as an update on the current status of the preparation of the European Transplant Sport Championships by the head of the organizing committee Teemo Lakkasuo.